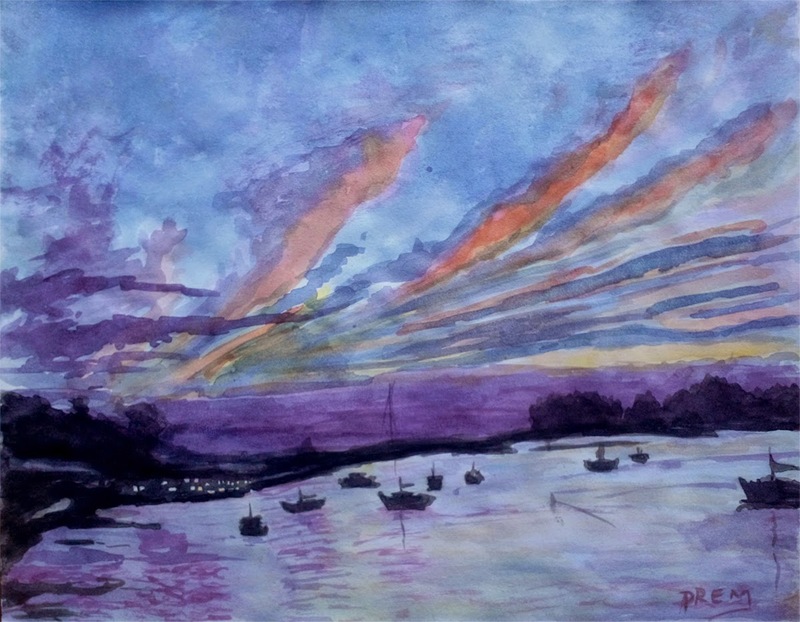 HomeWatercolor PaintingsReligious, Historical and Natural Landscapes! Hello Everyone! It has already been a month since I started painting full time. I have had mixed feelings and experiences during the whole time. Originally, my plan was to create one watercolor painting a day, working full time! But lately, I have started studying the theoretical aspects and other technical aspects of arts online and for the past week, I barely made a painting. I am making a comeback though. These paintings are about two to three weeks old. One thing is common in all these paintings, that they are made by referencing photographs. 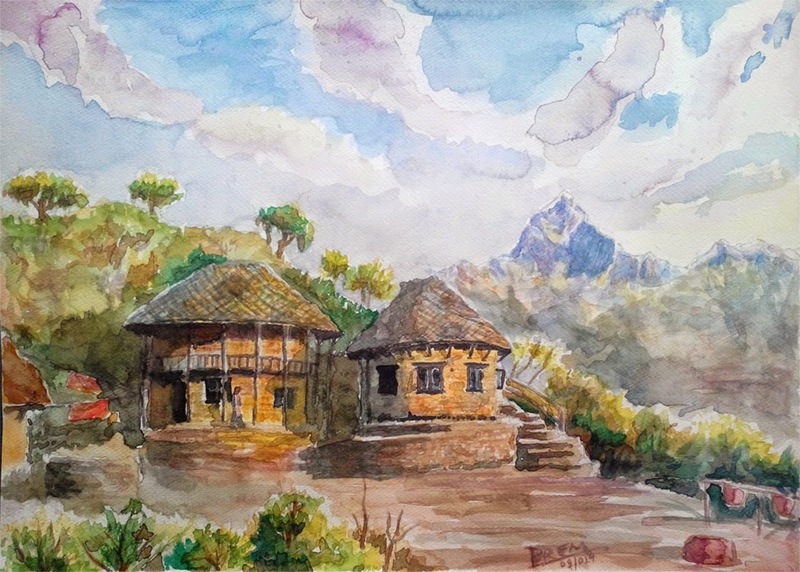 This is the painting of Bandipur, a beautiful place of historical importance, which lies in Tanahun district of Nepal. Warm and bright colors is the specialty of this painting. It is an A3 size (28 cm x 38 cm) painting, which has already been sold out! 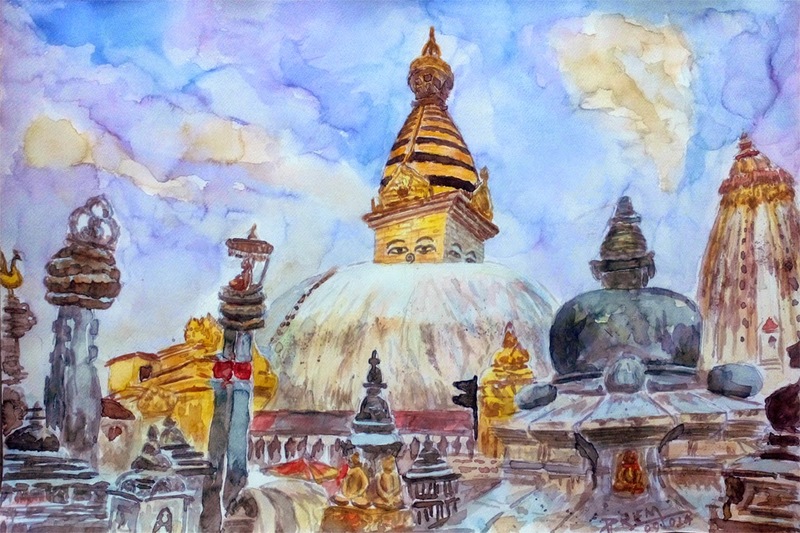 This is the bigger size painting of Swayambhunath Stupa, located in Kathmandu. I was satisfied with the way it came out, despite its complexity. It's the only big size painting among the ones here. The size is A2 which measures 38 cm x 58 cm on standard scale. It is also warm and beautiful and has already been sold out! This is a seascape in the dusk, and thus the cool mood. I painted this directly without sketching and this is the most satisfying work for me. All paintings in this post are made on French Cartridge except this one. It is done on a cheap (and thin) paper and I let myself flow freely, while painting this. It's size is also A3. 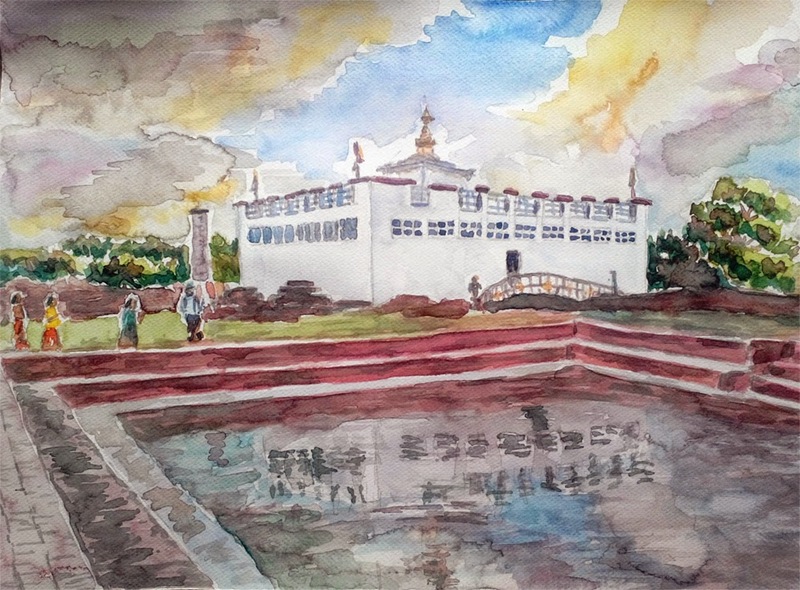 It is the religious site, Lumbini, of Nepal. It is the birthplace of Lord Gautam Buddha. Inside this beautiful building, the historical remains of the Buddha's time are preserved and are available for public viewing. This is a great site for religious tourism. This is also A3 size on French Cartridge. This is the most recent of all the paintings I am sharing here. However, I was dissatisfied on how it came out. The problem lies in overwork, which is detrimental to the watercolor artworks. 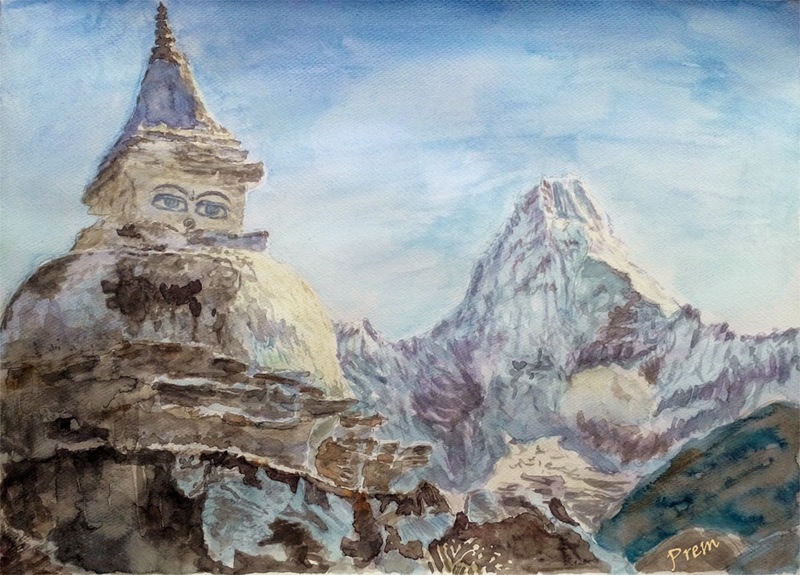 It is the usual A3 size as above with the Buddhist Stupa on the foreground and Mt. Ama Dablam in the background. It was amazing to notice that, this post is highly dedicated to the followers of Buddhism because three paintings are related to Buddhism - a nice coincidence! You can follow my updates more frequently from my Facebook Page.